GSP Enterprises provides Phenosafranine (C.I. 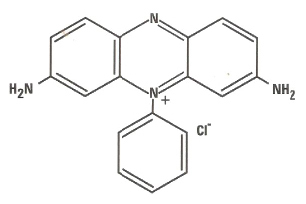 50200, 3,7-diamino-5-phenyl phenazinium chloride) which is widely used as a histological dye, photosensitizer and redox probe. Phenosafranine is not very stable in the free state where its chloride forms green plates. Phenosafranine dye has extensively been used in semiconductors as energy sensitizer and as a probe for studying various micro heterogeneous environments including micelles, reverse micelles and polymeric matrices. Phenosafranine has also been established as a DNA intercalator (Sarkar et al., 2008b) and is found to form dimeric aggregates at higher concentrations. The red safranin dye made by oxidation of a 1:2 mixture of para-phenylenediamine and aniline and used chiefly as a desensitizer in photography.